A team led by Sandia National Laboratories has found a zero-emission vessel running on hydrogen feasible. For the report, Sandia National Laboratories partnered with the Scripps Institution of Oceanography, naval architect firm Glosten and class society DNV GL. Findings showed it is technically and economically feasible to build a fuel cell vessel fit for coastal research in a manner consistent with marine regulations. 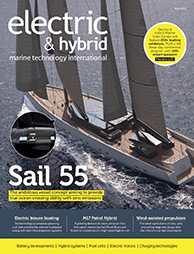 The project team dubbed their boat the Zero-V. Technical details centre around fuel cell power modules by Hydrogenics arranged into power racks with each rack holding six fuel cell modules, with total power output of 180kW. Small lithium-ion batteries bridge the fuel cell plant and provide both propulsion and ship service electrical power. With a total of ten racks, the vessel has 1,800kW of installed power, which is enough for a 2,400 nautical mile range (4,444km) at about 10kts, translating to 14 science missions with 4 different ports of call to refill hydrogen along the US west coast. Zero-V uses one propulsion motor to power each of its two propellers. The team determined that 500kW motors provide sufficient power for the various mission requirements and also have enough reserve power for safe operation in heavy seas and for dynamic positioning. To reduce weight, the vessel has to be constructed of aluminium. The beam and length requirements were driven by the requirement that the vessel be able to dock at all primary ports of call for the vessel. The research also included a well-to-waves analysis that put Zero-V at a worse value than a diesel-driven counterpart when using hydrogen generated from fossil natural gas. However, “the situation is dramatically improved using renewable hydrogen,” claims the report and names Linde and Air Products as being able to provide enough clean hydrogen for Zero-V to take up operation. With a design in place, the next step for Zero-V is finding funding to build it. Compared to diesel-powered research vessels, Zero-V has a similar capital cost, but would cost roughly 7% more to operate and maintain.